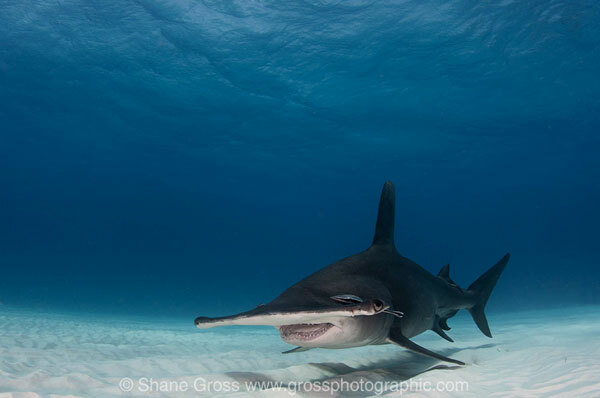 In January of 2013 I saw Neal Watson’s Bimini Scuba Center posting beautiful pictures of great hammerhead sharks. Like any shark lover and underwater photographer would in that circumstance, I immediately messaged them and asked how I could join the action. Three days later I was underwater with my absolute favorite shark. At the time it was a revelation; a new spot that promised what no other could. Fast forward only two years and the spot is famous in the dive community and countless divers have had the extreme pleasure of diving with these most amazing of animals. I have since been back and it is better than ever! 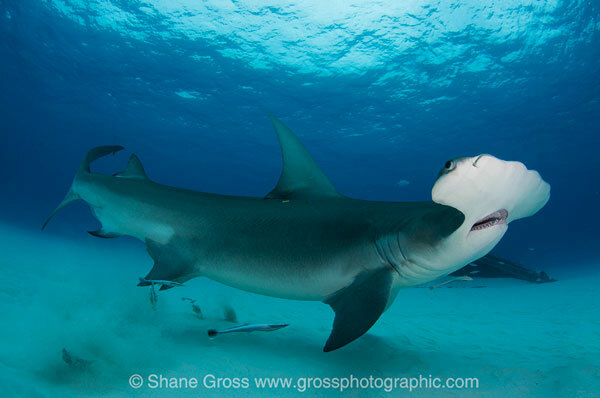 There are at least ten different species of hammerhead sharks. The great hammerhead (Sphyrna mokarran) is the largest, with some estimating they can grow to twenty feet in length. 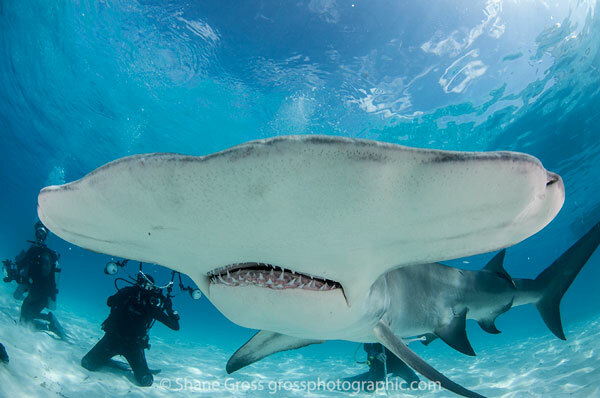 The ones we were diving with in Bimini were adults, mostly female, around 9-12 feet long – they are big sharks. The hammer season runs from December through April with peak time in January and February. There are many operators offering to go there. 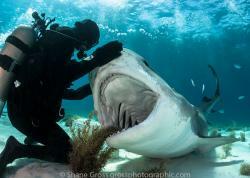 I have been out with both Neal Watson’s Bimini Scuba Center and Epic Diving. Both operators were fantastic in how they interacted with the sharks, helped me get the shot, used nice boats and provided great food. Both operators are land-based. 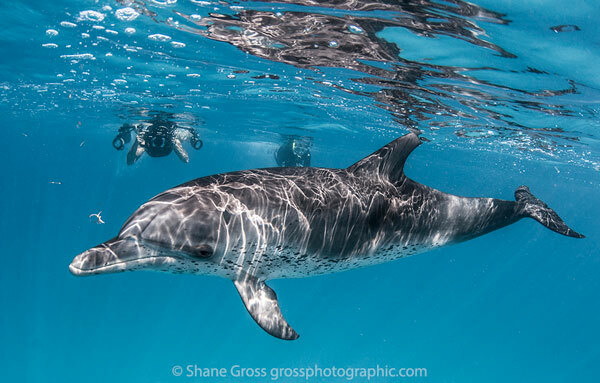 The hammer site is only a 5 minute boat ride from any of the resorts or hotels and the site is on the lee side of the island (usually protected), however, the winter weather can still kick up, causing divers to miss a day or two of diving. In 2013 the hammerheads took about an hour to show up, while in 2015 they only took about 15 minutes. They are generally only around in the afternoon, with boats leaving the dock around noon or 1pm, which frees up the mornings to see some of the other sites Bimini has to offer (see next section). The dives are usually only in about 15-20 feet of water, so they can last well over two hours. The feeder (expert shark handlers only please!) will bring down a bait box with some fish chunks to bring the sharks in close and keep them interested. The guests will form a “V” shape letting the scent from the box go down the middle. The sharks follow the scent to the bait box and all the guests get a great view. Full, dark wetsuits and gloves are needed and if you get cold quickly, like I do, a hood would make sense. The sharks are pretty well behaved; it’s clear they are only interested in snacking on the fish scraps and not on people. The first time I did the dive I was told that there is no record of any human ever being killed by a hammerhead shark and while I cannot confirm, I would not be surprised if it were true. However, they are large predators deserving of our respect, so follow the rules! If you do, it should be an extremely safe dive and I can attest that it is super fun. If you don’t come up with a smile on your face, well, you may be the first. 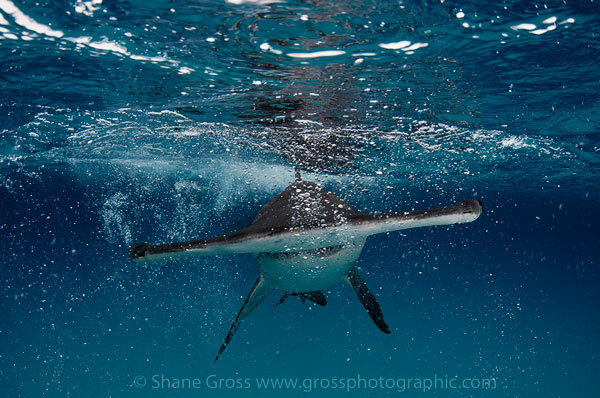 Great Hammerhead Sharks in the winter. This is already enough to make it a dream destination. Bull sharks in the marina. The Bimini Big Game Club has a cage off the end of their dock and you can have them fed in front of your face. Baby lemon and nurse sharks in the mangroves. Not only in the wild, but you can visit the Bimini Biological Field Station (Sharklab) to have a tour and learn about these cute sharks and even pet them. Seahorses in the mangroves. 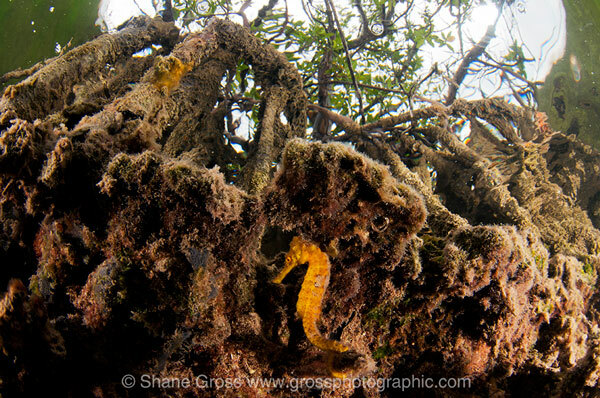 If you go deep in the mangroves at low tide you may be privileged to find bright orange or yellow seahorses! Southern stingrays. Just south of Bimini is Gun Cay where, with a little bait, you can have stingrays literally sucking on your dome port. 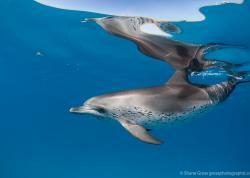 Spotted Dolphins. I was absolutely blown away by how playful these dolphins are. They came up within touching distance, and stayed there, several times. It’s a crazy cool list and I could keep going! Not only is the list impressive, but if you are lucky with weather you could see it all in a single week-long visit! If you go in winter. I went with a fairly basic setup. 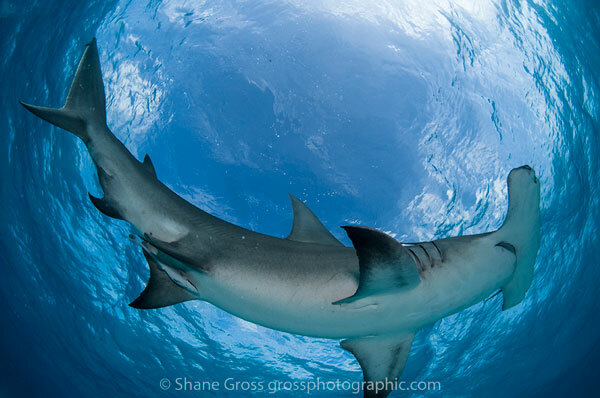 The Tokina 10-17mm fisheye lens behind a big dome port proved the ticket because these large sharks come in really close. Another photographer was using an 8mm circular fisheye and filled the frame with teeth. That’s close! It’s so shallow and bright on the sandy bottom that natural light shots can work really well. 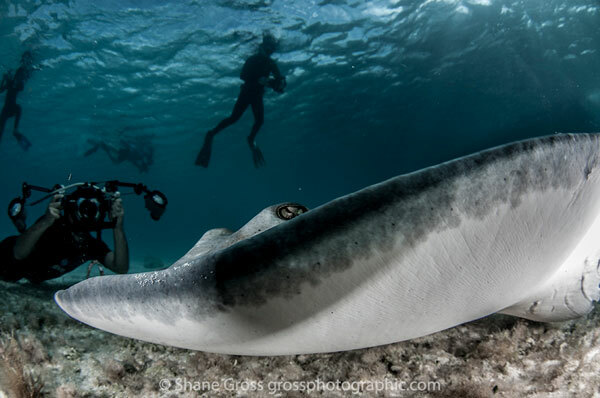 I brought my strobes, but turned them way down to try to just give a kiss of light to the underside of the shark. 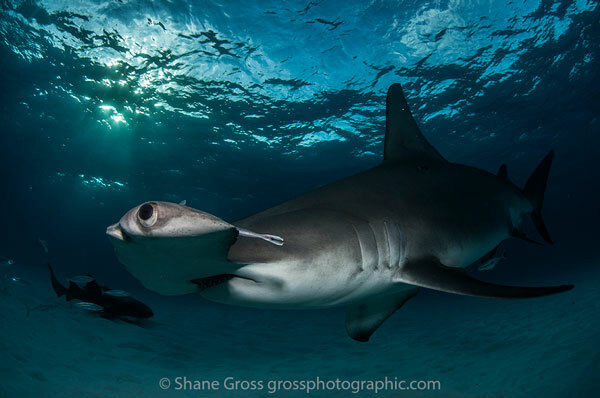 To avoid overexposing the sand I pointed my strobes up 45 degrees, which might look weird on other sharks, but we are talking about hammerheads here - weird is their middle name. I tried to focus on shots that show off their hammer – from below or from above. 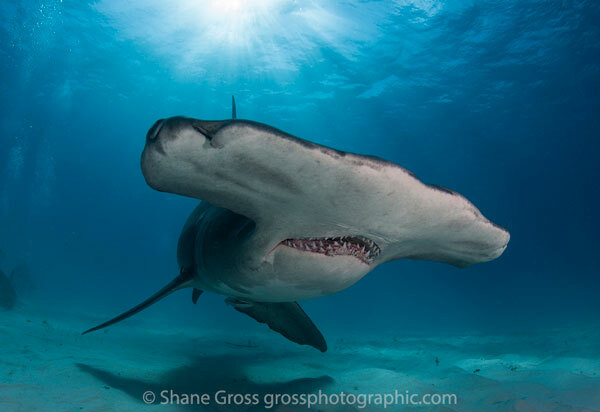 In 2013 I took a lot of standard side-portrait shots and in many of them a lay person wouldn’t even be able to tell they were hammerheads. I went with a fast shutter speed (1/250) to freeze the action and get the sharpest results. My Nikon D90 isn’t the best at high ISO so I keep it at 100 and then vary my aperture depending on the conditions. I enjoyed shooting when the sun was getting low. The sun rays or sunset added an extra element of beauty. No matter what setup you bring, I would advise you to shoot lots and make time to review your images each day so that you can learn from them. The opportunities are so many that simply experimenting can lead to great results. Play around and have fun - just keep your head up and pay attention to the sharks too. Oh! And be sure to take a few minutes to yourself without worrying about the camera. These are such amazing animals. 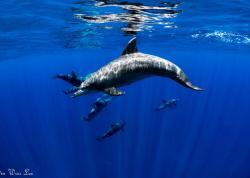 You are so freaking lucky to be there in the water with them! 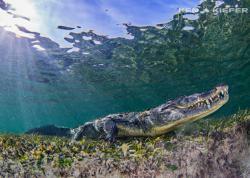 Bimini is a world-class diving destination with much to see and photograph. 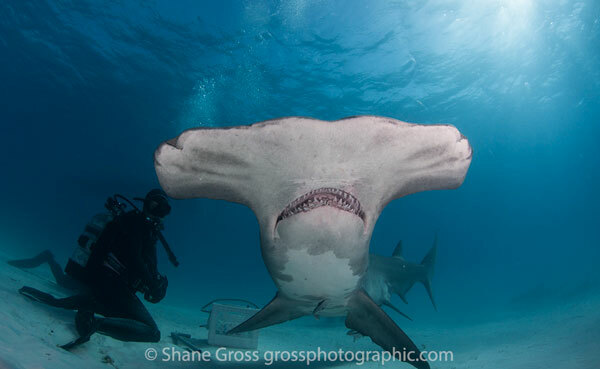 If you choose to go, you will get hours and hours with the hammerheads and shoot all the angles you can think of. My advice is to make sure to seek out all the other amazing things Bimini has to offer. As they say “Go for the hammerheads, stay for the bulls, lemons, stingrays, seahorses and dolphins.” Well, they should say that, anyway. 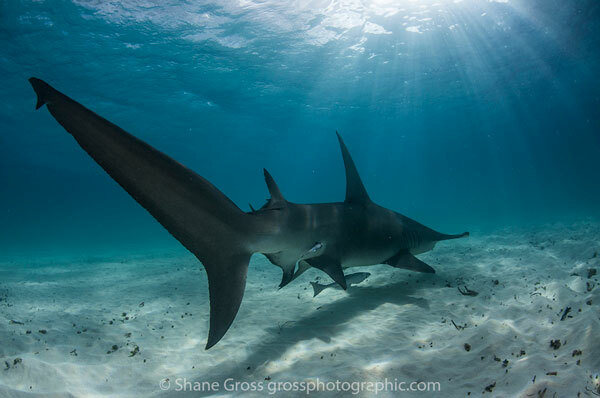 As for the hammerheads we all owe a big thank you to those who found and developed the site. 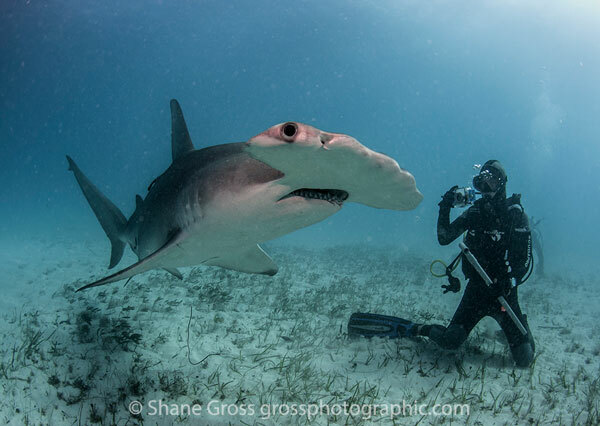 So thank you to the people of the Sharklab and Neal Watson’s Bimini Scuba Center. We all owe you one! Now it is up to all of us to respect the site, the sharks and not ruin a great thing. Bluewater Travel can help you plan and book the perfect Bimini and Bahamas dive trip. Visit BluewaterTravel.com for more info.